Kheris Rogers, a 10-year-old fifth grader from South L.A. has experienced her share of bullying for having dark skin — by both white and Black kids — throughout elementary school. She even remembers a time back in first grade when her teacher told all the students to draw themselves, handing her a black crayon instead of a brown one, sending her home in tears. “I thought I was really ugly after people were telling me I was ugly,” she told CBS Los Angeles in a recent interview. In response to her haters, Kheris pulled a page from Beyoncé’s book and started making metaphorical lemonade out of those bullying lemons — she launched a business! 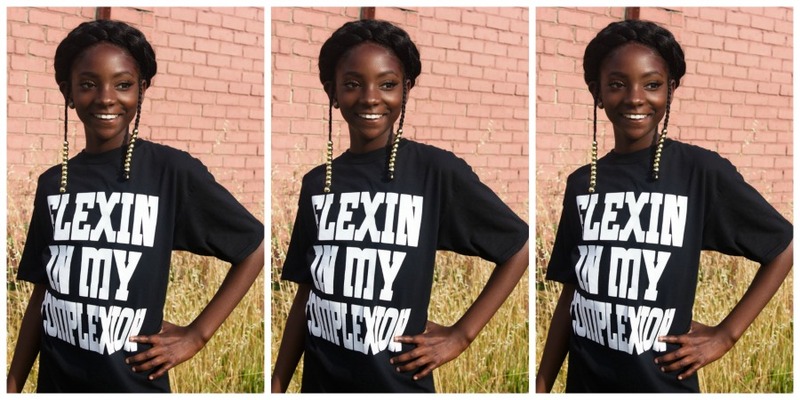 Her online store, Flexin’ In My Complexion features stunning pictures of Kheris modeling her first line of tees, which also say, “Flexin’ In My Complexion” and come in a variety of colors. The perfect reminder for all of us to celebrate our beautiful diversity. I am so glad you took a stand as a young positive, pretty, young lady to show these so called adults their stupidity as well as those who were bullying you. You are gorgeous & I say take that energy and spread it….it will make a difference. I have a granddaughter who is dark skin & have a overwhelming amount if confidence and she’s only 5…So we gonna support you & follow your success…Keep up the good work.